Recently I watched the first episode of The Knick, a new series on Cinemax that revolves around the goings-on at a fictitious hospital in turn-of-the-century New York. It stars Clive Owen as Dr. John Thackery, a brilliant and arrogant surgeon who treats his coworkers contemptuously but earns their grudging respect because he’s so darn good at his job. I’ve read that the show draws on the collections and expertise of Stanley Burns, who runs the Burns Archive of historical photographs. As a medical historian, I suppose it’s an occupational inevitability that I would view The Knick with an eye toward accuracy. Mercifully, I found the show’s depiction of the state of medicine and public health at the time to be largely appropriate: the overcrowded tenements, the immigrant mother with incurable tuberculosis, the post-surgical infections that physicians were powerless to treat in an age before antibiotics. I was a bit surprised by one scene in which Thackery and his colleagues operate in an open surgical theater, their sleeves rolled up and street clothes covered by sterile aprons as they dig their ungloved hands into a patient; while not strictly anachronistic, these practices were certainly on their way out in 1900. But overall, I was gratified to see that the show’s producers seem to be taking the medical history side of things seriously, even if they inject a hefty dose—or overdose—of drama. A temperamental genius, Thackery thrives on difficult situations that call for quick thinking and improvisation. He pioneers innovative techniques, often in the midst of demanding surgeries, and invents a new type of clamp when he can’t find one to suit his needs. He is also a drug addict who patronizes opium dens and injects himself with liquid cocaine on his way to work. 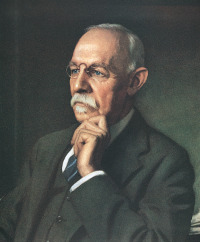 The character appears to be based on William Stewart Halsted, an American surgeon known for all of these qualities, right down to the drug addiction. Born in 1852 to a Puritan family from Long Island, he attended Andover and Yale, where he was an indifferent student, and the College of Physicians and Surgeons, where he excelled. After additional training in Europe, he returned to the US to begin his surgical career, first in New York City, then at Johns Hopkins Medical School. In addition to performing one of the first blood transfusions and being among the first to insist on an aseptic surgical environment, he was famously a cocaine addict, having earlier begun experimenting with the drug as an anesthetic. His colleagues covered for his erratic behavior, turning the other cheek when he arrived late for operations or missed work for days or weeks at a time. Twice he was shipped off to the nineteenth-century version of rehab, where doctors countered his cocaine addiction by dosing him with heroin. Although Halsted remained a cocaine addict all his life, he managed it well enough that by the time he died in 1922 he was considered one of the country’s preeminent surgeons and the founder of modern surgery. Halsted pioneered another modern innovation, as well: the overtreatment of breast cancer. In the late nineteenth century, women often waited until the disease had reached an advanced stage before seeking medical treatment. As historian Robert A. Aronowitz writes, clinicians “generally estimated the size of women’s breast tumors on their initial visit as being the size of one or another bird egg.” When cancer was this far along, the prognosis was poor: more than 60 percent of patients experienced a local recurrence after surgery, according to figures compiled by Halsted. In the 1880s, Halsted began working on a way to address these recurrences. Like his contemporaries, he assumed that cancer started as a local disease and spread outward in a logical, orderly fashion, invading the closest lymph nodes first before dispersing to outlying tissues. Recurrences were the result of a surgeon acting too conservatively by not removing enough tissue and leaving cancerous cells behind. The procedure he developed, which would become known as the Halsted radical mastectomy, removed the entire breast, underarm lymph nodes, and both chest muscles en bloc, or in one piece, without cutting into the tumor at all. Halsted claimed astonishing success with his operation, reporting in 1895 a local recurrence rate of six percent. Several years later, he compiled additional data that, while less impressive than his earlier results, still outshone what other surgeons were accomplishing with less extensive operations: 52 percent of his patients lived three years without a local or regional occurrence. By 1915, the Halsted radical mastectomy had become the standard operation for breast cancer in all stages, early to late. Physicians in subsequent decades would push Halsted’s procedure even further, going to ever more extreme lengths in pursuit of cancerous cells. At Memorial Sloan-Kettering Hospital in New York, George T. Pack and his student, Jerome Urban, spent the 1950s promoting the superradical mastectomy, a five-hour procedure in which the surgeon removed the breast, underarm lymph nodes, chest muscles, several ribs, and part of the sternum before pulling the remaining breast over the hole in the chest wall and suturing the entire thing closed. Other surgeons performed bilateral oophorectomies on women with breast cancer, removing both ovaries in an attempt to cut off the estrogen that fed some tumors. While neither of these procedures became a widely utilized treatment for the disease, they illustrate the increasingly militarized mindset of cancer doctors who saw their mission in heroic terms and considered a woman’s state of mind following the loss of a breast, and perhaps several other body parts, to be, at best, a negligible consideration. The Halsted radical mastectomy was on its way out by the late 1970s; within a few years, it would comprise less than five percent of breast cancer surgeries. The demise of Halsted’s eponymous operation had several causes. First, data from cancer survivors showed that the procedure was no more effective at reducing mortality than simple mastectomy, or mastectomy combined with radiation. Second, the radical mastectomy was highly disfiguring, leaving women with a deformed chest where the breast had been, hollow areas beneath the clavicle and underarm, and lymphedema, or swelling of the arm following the removal of lymph nodes. As the women’s health movement expanded in the 1970s, patients grew more vocal about insisting on less disabling treatments, such as lumpectomies and simple mastectomies. Halsted’s life and the state of surgery, medicine and public health at the turn of the twentieth century are a rich source of material for a television series, with the built-in drama of epidemic diseases, inadequate treatments, and high mortality rates. But Halsted’s legacy is complicated. He pushed his field forward and introduced innovations, such as surgical gloves, that led to better and safer conditions for patients. But he also became the standard-bearer for an aggressive approach to breast cancer that in many cases resulted in overtreatment. The Halsted radical mastectomy undoubtedly prevented thousands of women from dying of breast cancer, but for others with small tumors or less advanced disease it was surely excessive. And hidden behind the statistics of the number of lives saved were actual women who had to live with the physical and emotional scars of a deforming surgery. The figure of the heroic doctor may still be with us, but the mutilated bodies left behind have been forgotten. Robert A. Aronowitz, Unnatural History: Breast Cancer and American Society. Cambridge University Press, 2007. Barron H. Lerner, The Breast Cancer Wars: Hope, Fear, and the Pursuit of a Cure in Twentieth-Century America. Oxford University Press, 2001. Howard Markel, An Anatomy of Addiction: Sigmund Freud, William Halsted, and the Miracle Drug Cocaine. Pantheon, 2011. James S. Olson, Bathsheba’s Breast: Women, Cancer & History. Johns Hopkins University Press, 2002. Several weeks ago, the U.S. Food and Drug Administration approved the Cobas HPV test as a primary screening method for cervical cancer. As the first alternative to the familiar Pap smear ever to be green-lighted by the agency, this is big news. If gynecologists and other health practitioners adopt the FDA’s recommendations, it could change women’s experience of and relationship to cancer screening, a process we undergo throughout our adult lives. The HPV test probably won’t replace the Pap smear anytime soon, but it could pose a challenge to the diagnostic’s sixty-year standing as the undisputed first-line defense against cervical cancer. The Cobas HPV test, manufactured by Roche, works by detecting fourteen high-risk strains of the human papilloma virus, including HPV 16 and HPV 18, the pair responsible for 70% of all cervical cancers. (The Centers for Disease Control estimates that 90% of cervical cancers are caused by a strain of HPV.) If a patient tests positive for HPV 16 or 18, the new FDA guidelines recommend a colposcopy to check for cervical cell abnormalities. If she tests positive for one of the other twelve high-risk HPV strains, the recommended follow-up is a Pap smear to determine the need for a colposcopy. But critics fear that the new guidelines will lead to overtesting and unnecessary procedures, especially in younger women, many of whom have HPV but will clear the virus on their own within a year or two. Biopsies and colposcopies are more invasive, painful, and expensive than Pap testing, and might increase the risk of problems with fertility and pre-term labor down the road. Papanicolaou, a Greek-born zoologist and physician, spent his days studying the menstrual cycle of guinea pigs at Cornell University Hospital in New York City. Using a nasal speculum and a cotton swab, he extracted and examined cervical cells from the diminutive animals. Eventually he extended his work to “human females,” using his wife, Mary, as a research subject. He discovered that his technique allowed for the identification of abnormal, precancerous cells shed by the cervix. After a few false starts—his first presentation of his work was at a eugenics conference in 1928 and was panned by attendees—he went back to the lab, spending another decade on swabs and slides. By 1941 he had gotten his ducks in a row, and with a collaborator he published his results in a persuasive paper that was quickly embraced by colleagues. Thus was born the Pap smear. The Pap smear is not an infallible diagnostic. It can’t distinguish between cells that will become invasive and those that will never spread outside the cervix. Results can be ambiguous and slides are sometimes misread. Nonetheless, the Pap smear was a breakthrough at the time because it detected precancerous changes in cervical cells. It upended the customary timeline of cervical cancer, pushing the clock back by enabling diagnosis of the disease at a stage when lesions could be treated with relative ease and success. Since its introduction, it has contributed to a remarkable reduction in American mortality from cervical cancer, from 44 per 100,000 in 1947 to 2.4 per 100,000 in 2010, a roughly eighteenfold decrease in just over sixty years. When women in the U.S. die from cervical cancer today, it’s generally because they never had a Pap test, hadn’t had one within the past five years, or failed to follow up on abnormal results with appropriate treatment. The problem isn’t with the test itself; it’s with uneven access to screening and follow-up care. These are issues of class, geographic location, insurance status, and health literacy that the HPV test will do nothing to address. The Pap smear may not be perfect, but when utilized correctly it does a pretty good job of detecting cervical cancer. The FDA’s approval of the Cobas HPV test as a first-line defense and its new cervical cancer screening guidelines have the potential to subject millions of women to decades of invasive, expensive procedures, upending six decades of established practice for a protocol with no clear gains in effectiveness. And that is a very big deal. Siddhartha Mukherjee, The Emperor of All Maladies: A Biography of Cancer. New York: Scribner, 2010. Ilana Löwy, A Woman’s Disease: The History of Cervical Cancer. New York: Oxford University Press, 2011. Monica J. Casper and Adele E. Clarke, “Making the Pap Smear into the ‘Right Tool’ for the Job: Cervical Cancer Screening in the USA, circa 1940-95,” Social Studies of Science 28 (1998): 255-90. Joseph Colt Bloodgood, “Responsibility of the Medical Profession for Cancer Education, with Special Reference to Cancer of the Cervix,” American Journal of Cancer 15 (1931): 1577-85. Statistics on cervical cancer from the National Cancer Institute at http://seer.cancer.gov/statfacts/html/cervix.html. Last week marked the fiftieth anniversary of the landmark 1964 publication of the U.S. Surgeon General’s report on smoking and health. The 386-page document detailed the link between cigarette smoking and a number of diseases, including emphysema, chronic bronchitis, and coronary heart disease. Crucially, it stated in unambiguous, unadorned language the causal link between cigarette smoking and lung cancer. The average smoker was nine to ten times more likely than a non-smoker to develop lung cancer; for a heavy smoker, the risk rose to twentyfold. Smoking, moreover, hastened death. “Cigarette smoking,” the report read, “is associated with a 70 percent increase in the age-specific death rates of males, and to a lesser extent with increased death rates of females.” The greater the number of cigarettes smoked, the higher the death rate. I grew up in a time when smoking was both accepted and widespread. I remember pulling on the glass knobs of cigarette vending machines in restaurants, coughing my way through smoke-filled transatlantic flights, and catching a hazy glimpse of my junior high school English instructor taking a smoke break in the teachers’ lounge between classes. I surveyed the cigarette advertisements that filled the pages of magazines delivered to our house, pondering the rugged masculinity of the Marlboro Man and the self-conscious, flapper-era feminism of the Virginia Slims women. In the 1970s, my parents, both nonsmokers by that point, kept an ashtray in the living room for the convenience of any guests who wished to light up. The 1964 Surgeon General’s report was the work of a ten-member advisory committee made up of men from various medical fields. It included a surgeon, a pulmonary specialist, a bacteriologist, and a toxicologist. Appointed by Surgeon General Luther Terry, the group met at the National Institutes of Health in Bethesda, Maryland for over a year to review more than 7,000 articles on tobacco and disease. At the time, 42 percent of Americans smoked. Terry was so worried about the potential repercussions to the economy, given the report's negative findings, that he scheduled his press conference on a Saturday morning to minimize the effect on the stock market. The association between smoking and disease documented in the report was not new. Epidemiologists had been exploring the link since the 1930s; their work established causal inference as an acceptable standard of proof and transformed what constitutes adequate knowledge in medicine and public health. 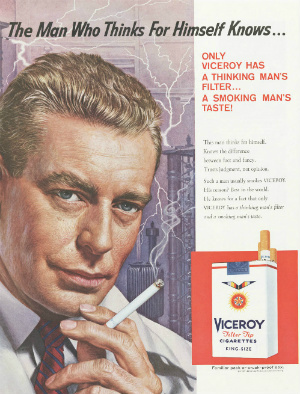 In 1957, the previous Surgeon General, Leroy Burney, had noted the increasing implication of excessive cigarette smoking in the causation of lung cancer. But the comprehensiveness of the 1964 study and the overwhelming weight of the evidence were so convincing that Terry, a smoker himself, switched from cigarettes to a pipe in the months before the report was released, believing the latter to be less harmful. Another member of the committee quit altogether. A third, the heaviest smoker of the group, was diagnosed with lung cancer less than a year later and underwent surgery to remove a lung. It was less the findings of the 1964 report than the publicity surrounding its release that catapulted the issue of tobacco use to the forefront of American public health. In the months following, smoking rates plummeted immediately­—and temporarily—by 15 percent, a measure of the gravity with which the news was received. It raised the specter of lung cancer in the public consciousness, laying the groundwork for decades of legislation restricting the use, sale, and advertising of tobacco products. From the placement of warning labels on cigarette packages and constraints on television advertising to curbs on indoor smoking and limitations on sales to minors, it changed public opinion about smoking and generated pressure for politicians to act. It also strengthened the resolve of tobacco companies to create doubt about the link between smoking and serious disease. Until its dissolution under the terms of the Tobacco Master Settlement Agreement in 1998, the tobacco industry continued to dispute the scientific evidence by funding its own studies through its research arm, the Tobacco Industry Research Committee. In my lifetime, I have seen the ways in which cultural attitudes toward smokers have shifted. No longer viewed as rebellious or sophisticated, the act of smoking has increasingly been vilified as smokers have been exiled from bars and shunted from entire offices to single rooms to the outdoors, where they huddle in doorways as they maintain their addiction. But while the luster and influence of the tobacco companies have dimmed, they have not disappeared. Today, 19 percent of Americans continue to smoke, or about 43 million people. Smoking remains the leading preventable cause of death and disease in the U.S., and rates are increasing in China and other parts of Asia as corporations search for new markets, preferably ones with fewer restrictions on the sale and advertising of their products. Perhaps the most significant legacy of the 1964 report, in addition to the lives saved through anti-smoking measures, has been the promotion of an ideology of individual liberty regarding public health. After the U.S. began to require warning labels on cigarette packages, tobacco companies sought to portray smokers as adults whose freedom to indulge in the habit was being unfairly infringed upon. According to this line of thinking, the decision to smoke was a matter of personal choice, and the government shouldn’t be allowed to restrict someone’s ability to engage willingly in unhealthy behavior. If an individual knew the risks of smoking and still wanted to light up, then he should have the right to do so and bear whatever consequences might befall him. As public health agencies today struggle to enact laws limiting the size of sugary beverages and requiring calorie counts on restaurant menus, we can look to the previous fifty years of tobacco control for antecedents both to these attempts to regulate our behavior and to our understanding of their cultural meaning. Smoking and Health: Report of the Advisory Committee to the Surgeon General of the Public Health Service. Washington, DC: U.S. Department of Health, Education, and Welfare, 1964. Full text at http://profiles.nlm.nih.gov/ps/access/NNBBMQ.pdf. Allan M. Brandt, The Cigarette Century: The Rise, Fall, and Deadly Persistence of the Product that Defined America. New York: Basic Books, 2007. Background on the 1964 report from the National Library of Medicine at http://profiles.nlm.nih.gov/ps/retrieve/Narrative/NN/p-nid/60. Current statistics and other data on smoking from the Centers for Disease Control at http://www.cdc.gov/tobacco/data_statistics/index.htm.